“Last Joy” is a 2015 animated short created by the animator Joe Reta as a graduation project from Vancouver Film School. I was invited by Joe to join the project collaborating with art direction and illustration for specific parts of the movie. I first met Joe during a summer intensive course we took at VFS back in 2012. After he came back to Vancouver to attend the full course at VFS we had the opportunity to collaborate again for his graduation project and it was an awesome experience. At the time I became involved in the project most of the 3D modelling and animation was done and it was time to work on the opening scene and title, final credits and to develop scenario objects. The main character is a sad old man that lives in a retirement home. In order to reinforce the idea that he feels alone and desires to die we had the idea to create photo frames showing the character during different moments of his life, with a lot of friends when young and with less friends as he was getting older. Usually a 3D character is modelled after a sketch but in this case the process was the opposite: I had to recreate the character in a cartoonish style following the 3D original, making him younger every time. That was an interesting part of the process since I had to work from the face shape outwards adding hair and less expressions. The idea here was to fill the environment with everything that would be added to the render and not be modelled like signs, posters and objects. These illustrations were used in two scenes that are pivotal to the movie plot: the character’s room at the beginning and the reception desk at the end. The photo frames represent the character’s past history portraying him with less and less friends as he gets older and the office scene featured a calendar and a medical poster behind the nurse character. The idea for the title was to recreate a detail of the scenario using the same background to maintain the movie visual and atmosphere. In this case the perfect solution was to use the wallpaper of the characters room with the title and other information composing the scene. 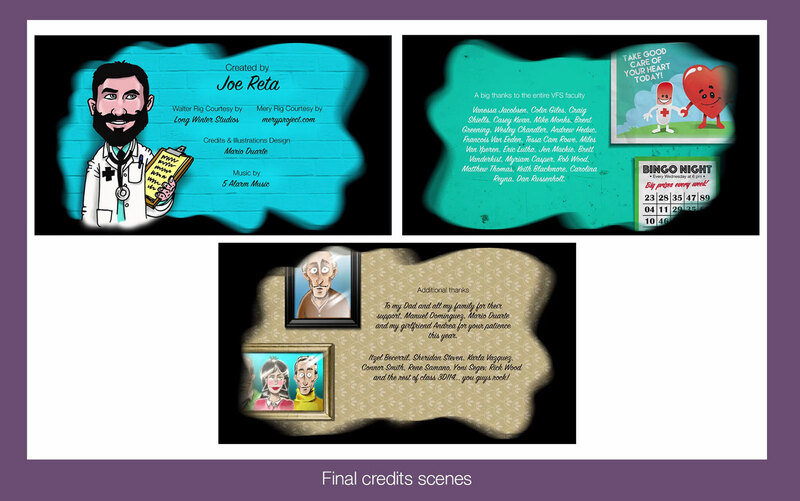 For the final credits we had the idea of creating a new character that would be a doctor resembling Joe Reta and this would be the first of 3 scene credits. The other 2 would be the character’s room and the nurse’s station. The animation was presented in January 2016 in Vancouver and it was a success. Joe Reta graduated from VFS and is currently working on new projects.